New all-time highs as the market rebounded from an early selloff. Buyers keep buying this market and there is clearly no problem with demand. Today’s record was set on elevated volume, showing plenty of strength left in this bull. The cynics were dealt another defeat. They will be right at some point, but timing is everything and they remain on the wrong side of the trade. Tomorrow is the first day of May and we get to hear everyone promote “Sell in May….”. There are two views on this, those that fear summer weakness and already sold, and those that don’t care and are still holding. At this point Sell in May has already been factored into the market is a non-issue. We could selloff for any number of reasons, but Sell in May is not one of them. If anything this is slightly bullish because recent sellers become potential buyers as the rally continues. Traders remain wary of this market and with plenty of good reasons, but the market is not listening. Since we make and lose money by the market’s moves, that is what we need to give the greatest weight to. At the same time we cannot lose sight of what others are saying because they could eventually be right. We are four-years into this bull market and it is fairly old for a bull. Currently we are living on easy money complacency. The real shock will come on the first hints of withdrawing monetary stimulus. We are still a ways from the Fed increasing interest rates, but the a whiff of winding down bond buying will send people running for cover. If the economy continues making progress, we could reach levels where the Fed feels comfortable pulling back, but like any junky, the market is going to suffer from painful withdrawals. While the economy might be stable, we could fall into bear market. Keep doing what is working. The market is on the verge of hitting 1600 for the first time in history and buyers continue showing up in sufficient numbers to hold us at these levels. The more people fear this market, the more comfortable I am. We need to take this day-by-day, but the likely outcome is a strong summer with weakness getting pushed back to the fall. We could see a 3-5% pullback at any point, but the larger correction is still months away. There is a lot of air under the market and anything could trigger a stampede selloff. Price action remains bullish, but we need to watch for cracks in the foundation. As small traders we have the advantage of speed. Use trailing stops to ride the market higher while guarding against the eventual breakdown. The market likes round numbers and 1600 is just a couple of points away. We might see a little selling after brokers pass out the 1600 hats, but as long as we hold 1570 everything is fine. Investors looking to get in this market don’t let much weakness develop before jumping on discounted shares. 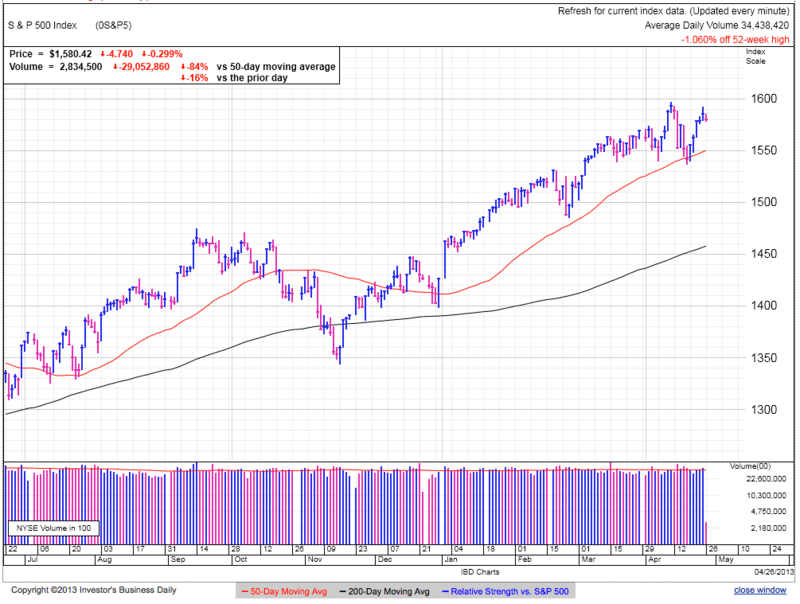 Slipping under 1570 means buyers are no longer enthusiastic and more cautious, likely leading to a test of the 50dma. Failing to hold 1540 means we ran out of buyers willing to buy these levels and we need to fall further before value investors will step in. AAPL had a strong debt offering as part of its plan to return cash to shareholders. It is nice to see the company sharing the wealth with shareholders, but it is too bad it cannot find something more innovative and exciting to do with its profits. We can continue higher on a relief rally, but it is hard to get excited about an iPhone5s and we should expect AAPL to fall further behind Samsung this year. It is also likely the Galaxy S4 will outsell the iPhone5s as few iPhone4s users feel compelled to spend the money upgrading. PCs have a 4-year refresh cycle and as smart phone capabilities plateau, expect a similar shift to less frequent upgrades. But what is bad for AAPL is good for ATT and VZ. AMZN recovered the 200dma as dip buyers rescued the stock. Was the selling overdone or just getting started? 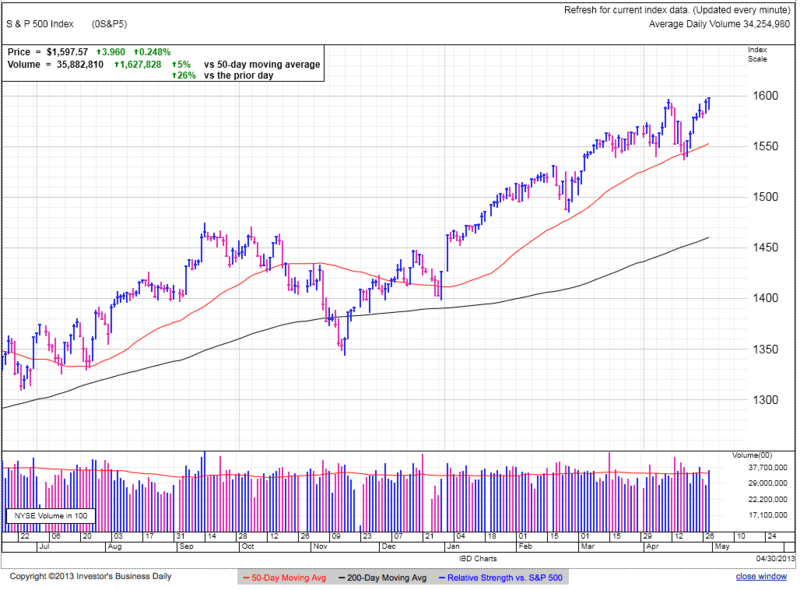 The rebound can continue for a couple more days, but another test and violation of the 200dma shows a lack of conviction from buyers and more selling is likely. But a note for shorts, this is a trading stock and AMZN is not going out of business anytime soon. Don’t get greedy and take profits near $220. For longs, it is hard to get excited about this bounce until it reclaims the 50dma. I had a reader request to look at TSLA. I hadn’t pulled up the chart in a while and boy did I miss an impressive move. It is hard to be anything but cautious after such a strong run. 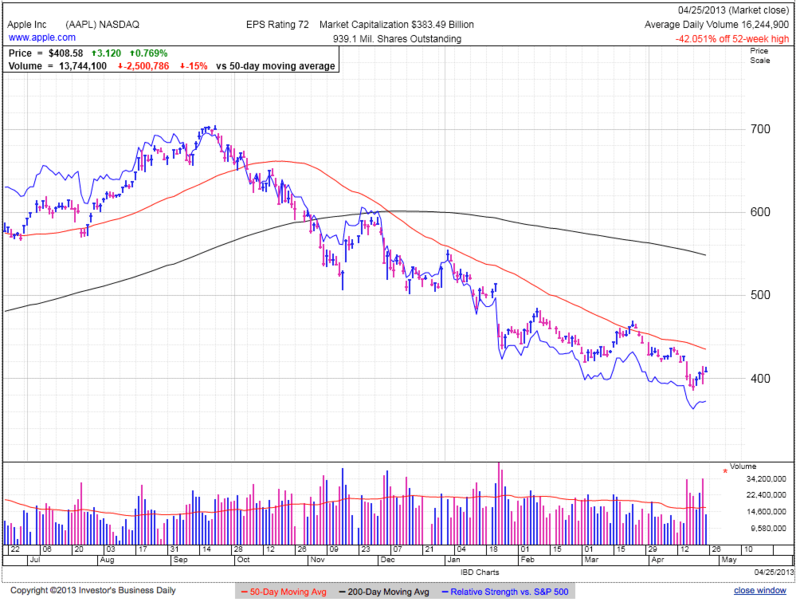 Today’s huge volume reversal is also an obvious concern. Anyone lucky enough to ride this higher should consider locking in some, if not all of their profits. There could be more to this move, but obviously the rate of gains cannot continue at this pace. A bull could buy back in after finding support at $45. As for shorting this stock, it is tough to get in front of such a strong move, but if someone is feeling lucky, short with a stop at $55 or $58 and take profits at $45. Since this is such a volatile stock, manage risk by trading a smaller than normal position. While I cannot review all the stocks people request, I’ll try to incorporate reader request in future posts, so keep leaving suggestions in the comments. Stocks are modestly higher after recovering from earlier weakness. The market barely has time to selloff before the next wave of buyers rushes in and props it up. No matter what common sense tells us, we trade the market and as long as holders keep holding and buyers keep buying, we continue going higher. The most challenging part of becoming a true contrarian trader is seeing the difference between price and the crowd. Most people wrongly assume contrarian is going against the trend, but far more often the contrarian trade is going with the trend. When everyone is saying too-far, too-fast, the contrarian trade is sticking with the rally. That is exactly what is going on here. There are a million reasons to sell this market, but it keeps going higher because the crowd is already out of the market. Stock continue defying expectations and are just under 1600. When in doubt, stick with the trend and that has never been truer than this market. I have no idea how much further this can go, but buyers snap up every dip and keep a solid floor under this market. The new buzz is “Sell in May……”, but if that is what everyone expects, look for a strong summer. Of course the longer this holds up, the more we need to fear the inevitable correction. But that is then and this is now, so stick with the trend until the market tells us otherwise. The market defies skeptics and the pool of cynics grows smaller with each bounce. Without a doubt this market will selloff at some point, the only questions are when and how much. We are looking for a double-top above 1597 and a resulting selloff under 1570 to signal buying is finally drying up. Stick with what is working. We could see a step back in coming days after such a strong bounce off the 50dma, but holding above 1570 shows buyers continue supporting this market. 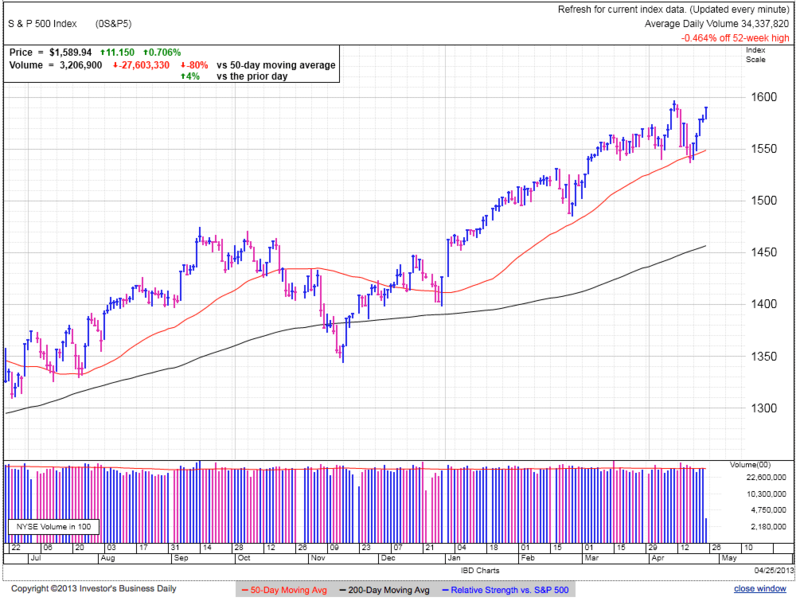 A dip under 1570 likely means a test of the 50dma and a break of this level is when bears finally get their day. 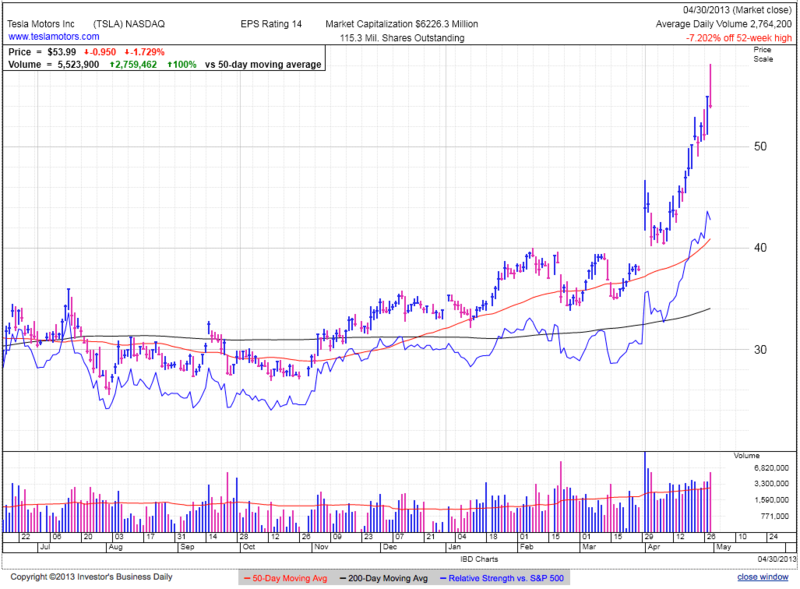 AAPL is surging above the 50dma. The question is if this is the rebound everyone’s been waiting for. The stock decisively reclaimed prior support at $42o, but needs to break $470 before it ends the streak of lower-highs. Without a doubt this could be the end of the selloff, but every other bounce over the last eight-months was a selling opportunity. Why will this time be any different? That’s a question any bull needs to answer. We should know pretty quick if this is just another bump on the way lower or if there is real buying behind this move. $430 is a decent trailing stop for any holders and will allow unlimited upside, but protect capital from another selloff. If you want me to write about a stock, post it in the comments and I’ll pick a few when I see something interesting. Obviously I cannot provide insight into every stock out there, but I’ll try to include a couple new stocks here and there. I had a request for TSLA and will get to that one tonight. We set a new closing high on light volume. Some people worry about the sustainability of light volume, but this market sure doesn’t. We are a hair under 1600 and well past the point of a head-and-shoulders top. The next potential bearish pattern is breaking through 1600 and forming a double-top, but at this point these predictions are mostly wishful thinking from cynics who missed the rally. This market cannot go up forever, but as long as it keeps going up we should ride it, not fight it. The rally remains in effect until we start making lower-highs and lower-lows. I was bearish until April 19th’s bounce off the 50dma. The market had the perfect setup to selloff, yet it bounced instead. When the market doesn’t act as expected, it is right and we are wrong. No ifs, ands, or buts. We made a mistake in our analysis and need to change our outlook. We might eventually be proven right, but never forget, in the market early is the same thing as wrong. The market continues rallying because cynicism is the rule, not the exception. Even bulls are waiting to buy the pullback. When everyone expects near-term weakness, they sell ahead of it and wait to buy it, but this behavior prices in the pullback and it doesn’t happen. In fact the opposite is more likely because recent sellers become the next crop of buyers. That is why this market continues defying gravity. It will be interesting to see where the market goes from here. Willy buying dry up near recent highs and we stay within the trading range, or will we breakout and defy the doubters by marching to new highs? Chances are it will do a bit of both. Look for a new breakout and then a consolidation of those gains. Holding above 1570 shows buyers are still supporting this market. The market has a nasty habit of convincing us we are wrong before proving us right. Many bears are giving up and going long this market. That buying is the fuel pushing us higher, but these are often the last buyers. The market is far more patient than most traders and only after people give up waiting for the pullback will it finally happen. Look for new highs in coming days, and use this opportunity to move a trailing stop up to 1570. If we break this support level we will dip to the 50dma and possibly challenge 1540. Failing to hold 1540 means the long predicted selloff is finally taking hold. AAPL finished just shy of the 50dma and is up 10% over the last couple weeks. Is this finally the bottom all the bulls have waited for? Could be, but it sure doesn’t feel like the move down to $385 was true capitulation that dramatically altered sentiment and ownership in the stock. We could rally for a few more days, but AAPL is a trading stock, not an investing one and the best money is made buying dips and selling rallies. We probably have one more whoosh lower before finally demoralizing and chasing off the last of the hopeful, especially now the last bullish catalysts have come and gone. AMZN broke the 200dma and presents an interesting shorting opportunity with the 200dma as a stop-loss to buy the stock back. We easily could see a bounce back above the 200dma before a larger selloff begins, but with a tight stop, the risk is limited and the potential gains are large. A bear needs to be patient and it might take a couple tries before he finally hits on the mother load. A rebound above the 50dma means the expected breakdown is not happening and a bear needs to wait for another opportunity. GLD mostly closed the gap from $143. Does this mean the selloff is done, or just a dead cat bounce on the way lower? This easily could be the V-bottom that ends the slide starting back in September, but this is an insane amount of volatility for a “safe” commodity. I’m not in gold and have no interest, but if I were, I’d be looking to sell this bounce, not buy it. If you want me to write about a stock, post it in the comments and I’ll pick a few when I see something interesting. Obviously I cannot provide insight into every stock out there, but I’ll try to include a couple new stocks here and there. Stocks found a bid and are above 1590 in early trade. The market is only a few points from the highs as buyers continue supporting these levels. The inevitable selloff eludes bears and sustained buying defies common sense, but that is how the market works. What is expected is already priced in, making the unexpected more likely. Traders lightened up ahead of the expected pullback, meaning most of that selling already happened. More than just reduce supply, this preemptive selling also created a new pool of buyers ready to chase the market higher. There is no free lunch in the markets and the longer we put off a pullback, the bigger it will be, but so far the market seems content rallying higher. With all the expectations of “sell in May and go away”, a contrarian should look for summer strength this year. I was one of those cautious bears until the market refused to break down a couple of weeks ago. It is impossible to always know what the market is going to do, that is why we need to remain flexible and willing to reevaluate our views when key parts of our original thesis are invalidated. It is okay to be wrong, it is fatal to stay wrong. We are challenging recent highs at 1597 and will likely break thought this level, but what comes after that? Over the last couple months buying stalled near the highs and could easily happen again as big money investors prefer buying weakness. As it stands, there are no fatal flaws in this market and the economy continues heading in the right direction, albeit slower than most would like. We need to stick with what is working until we see real signs of a breakdown, most likely in the form of lower highs. Another material selloff and breaking recent support will demonstrate how fragile this rally is. Markets can only bounce so many times before they exhaust the supply of dip-buyers. Use trailing stops to protect long profits and watch key support levels for short entries. Summer is traditionally a weak period and we need to be cautious of the “sell in May…..”. As long as the market holds 1570, the rebound is alive and well. We might surge higher on a break of 1600, but a step-back to 1575 would be normal and expected because big money is reluctant to buy the breakouts. Failing to hold 1570 signals a potential retest of 1540. Falling under 1540 means the inevitable correction is upon us and more selling is likely. 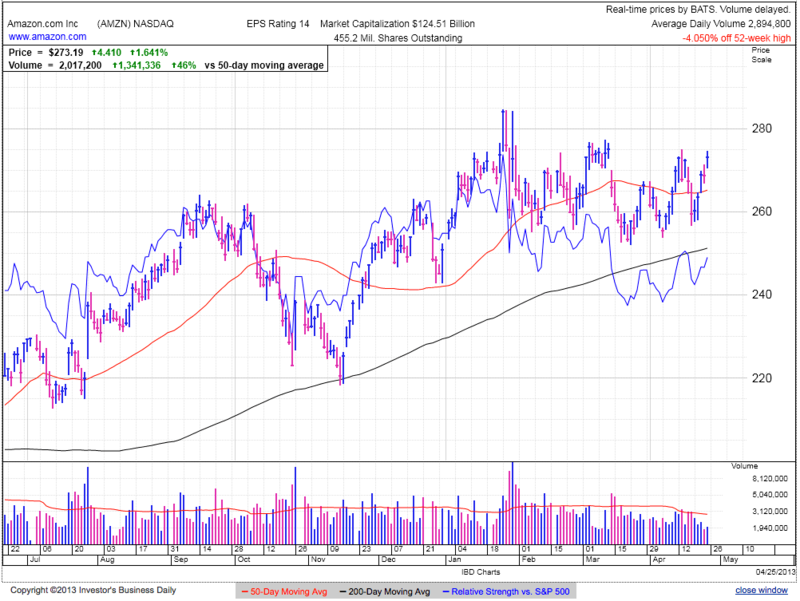 AAPL is challenging the 50dma on a strong surge higher. It received good press and that excited buyers, but I cannot think of a time over the last six-months when the press and analysts have been anything but positive on AAPL. Journalists and analysts opinions don’t change the fundamental story and this is probably one more bounce before the last flush out lower. Falling to $350 will finally demoralize hopeful bulls and give value investors the opportunity to buy a decent dividend. Unfortunately for the growth investor still hanging on, don’t expect value investors to bid up the stock to old highs. AMZN slipped to the 200dma, but is still holding this level. Look for selling to pick up when we break it, but take short profits quickly because any move lower will be a series of waves. Lock-in profits when you are most confident and cocky and re-sell the stock short again on the next bounce. We could still see a bounce off the 200dma and the short entry would then be a retest of this level when the bounce falters. If we don’t see a bounce, short a move through the 200. 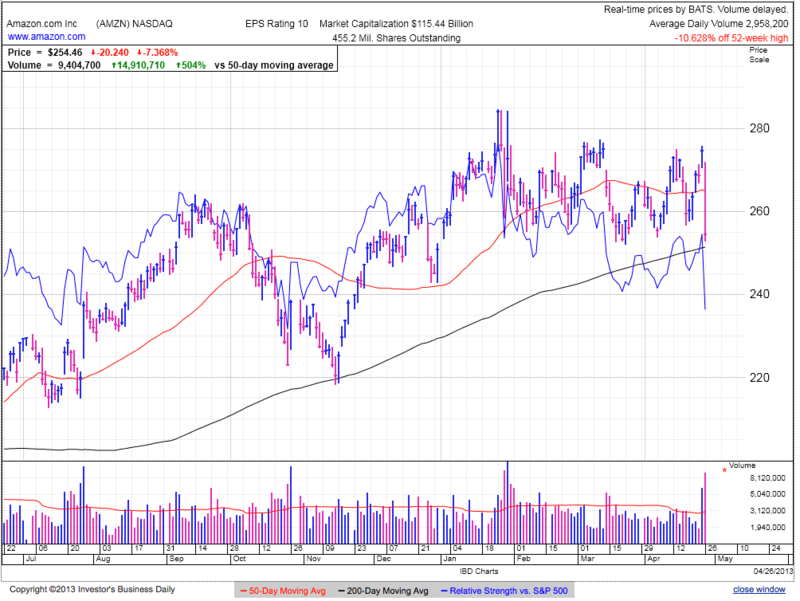 GOOG is having a good day as it bounces off the 50dma. The current logic says AAPL’s loss is GOOG’s gains. In the market reality doesn’t matter, only perception. If people think GOOG is the next big winner, then it will be. I still think the stealth play is MSFT. While everyone is focused on mobile operating systems, mobile processors, and mobile applications, MSFT and INTC are the only ones trying to make full powered devices in compact packages. In a few years will the consumer want a neutered tablet that only runs mobile applications and doesn’t give them access to their files, or will they want a full powered tablet that works seamlessly with their work computer? 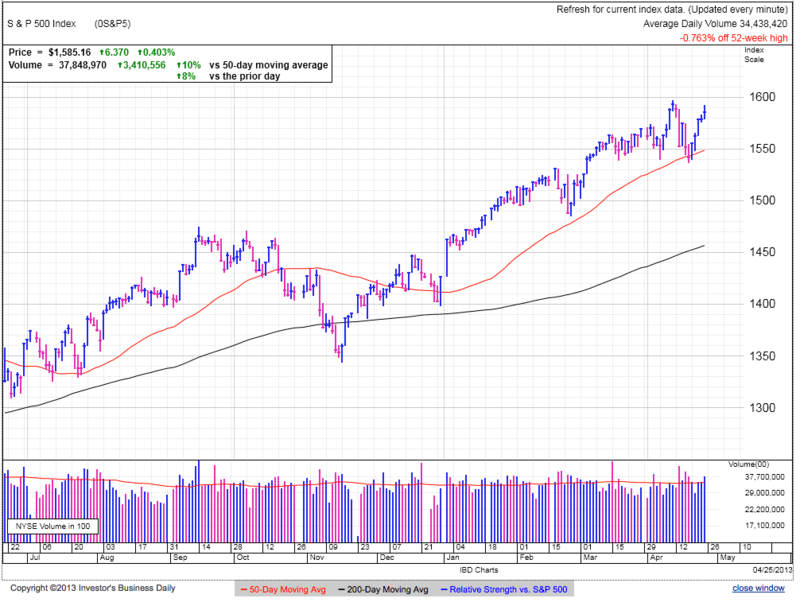 Elevated volatility continued for the third week as the market rose 1.75% and extended the bounce off the 10wma. We remain inside the recent trading range between 1540 and 1597, but are above previous resistance at 1570. Increased volatility is often seen in market tops as the debate between bulls and bears intensifies. This week’s rebound was the third largest weekly gain since the start of the year, but for all the criticism thrown at this market, we are still within 1% of the highs. Believe in this rally or not, we live and die by price and right now prices are near all-time highs. This rally is fueled by an abundant supply cynicism and is why we continue heading higher. Markets go down because people stop buying and start selling. No matter how far this rally came, holders keep holding and buyers keep buying. Until this changes, expect the rally to keep going. Every dip is a buying opportunity because large institutions use the weakness to build their positions. It is anyone’s guess how long this can continue, but we need to stick with that is working until it stops. We remain inside the trading range between 1540 and 1597. Recent volatility could signal the last gasps of the rally before we roll over, or the volatility is flushing out weak hands and clearing the way for another leg higher. Elevated volatility accompanies market tops and we have that in spades, but market tops are due to a lack of buying. So far we have an endless supply of buyers willing to rush in and buy every dip. As long as we keep making higher highs, the stick with the market. The best thing about being small and nimble is we can respond to the market’s moves and don’t need to anticipate them. If we don’t know comes next, we simply wait for the market to tell us. Until we have evidence to the contrary, assume the rally is alive and well. The market is stuck in a range between 1540 and 1595. Setting new highs shows there are ample buyers willing to chase. If we stall and break through support at 1570, look for continued selling to the lower end of the trading range. As long as we stay above 1540, the rally is still intact and the dip is buyable. But there are only so many times we can test a level before failing, so be extremely cautious and use tight stops under this level. 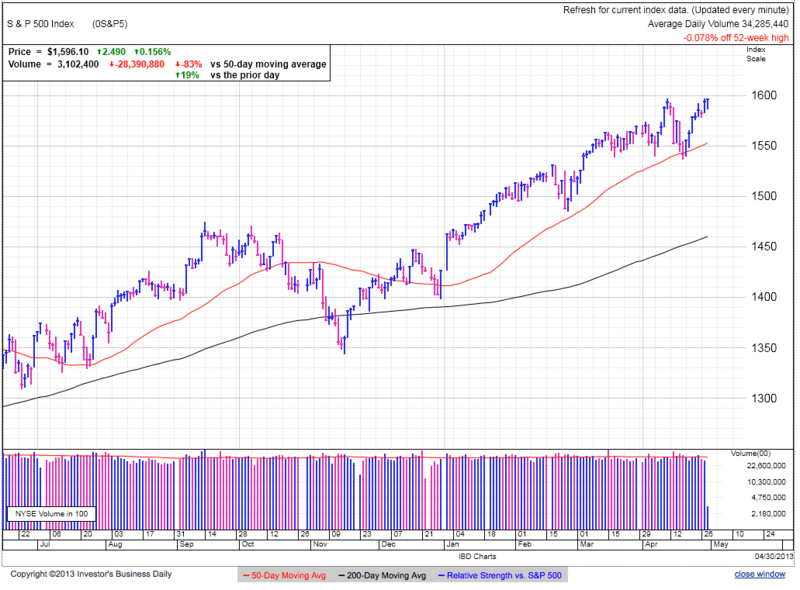 Stocks finished modestly lower on Friday, but held above 1580 in light volume. This is a tough market to trade and the only groups making money are proactive swing-traders and option premium sellers. The market is currently pushing toward recent highs, leaving us wondering if this strength is a another selling opportunity or the start of the next leg higher (or lower). Volatility’s picked up in recent weeks showing traders are becoming restless and ready for the next move. We rarely get this long to sell the top, meaning the next leg is likely higher. That doesn’t mean the breakout is sustainable, just that the next move is higher. There are more reasons to avoid this market than buy it. In fact I cannot think of a reason to buy other than it is going up. This rally is old. We are at all-time highs. There are a slew of negative economic indicators. Too-far, too-fast. Etc. Everything points to a topping market, but we have to ask why the market is not breaking down in the face of all this negativity. The answer is surprisingly simple; there are more buyers than sellers. But how can this be? It’s actually not that counterintuitive if we look at it from the right point of view. Those that are paranoid already sold, meaning most of the selling already happened. Buyers that bought this uncertainty are comfortable with their analysis and willing to sit through near-term volatility. Getting rid fo the nervous and replacing them with the confident takes a lot of supply out of the market and makes it far easier for the rally to continue. And that is exactly what we’ve witnessed. Our job is not to figure out what the market should do, but what it will do. Right now it looks like it will continue higher. A little selling today is normal, expected, and healthy after a five-day, fifty-point rally. The dip was modest and found a floor at 1580, well above recent resistance at 1570. As long as we hold 1570, expect the rally to continue. I cannot say for how long, but at least expect new highs above 1600. Markets have a nasty habit of misleading even the best of us and just when it looks like it won’t breakdown, it breaks down. I don’t mind being on the wrong side of the trade, but I hate staying on the wrong side. The market is defying cynics and it is far more profitable to trade with the trend, but we need to watch for the breakdown because it will come when we least expect it. The rebound remains intact as long as we hold above 1570. Failing support at 1570 shows the trading range is sucking us back in, but the market tis not breaking down until we test and violate 1540. Bulls can use 1570 as a trailing stop and bears as a short entry. AMZN lost 7% on gigantic volume. 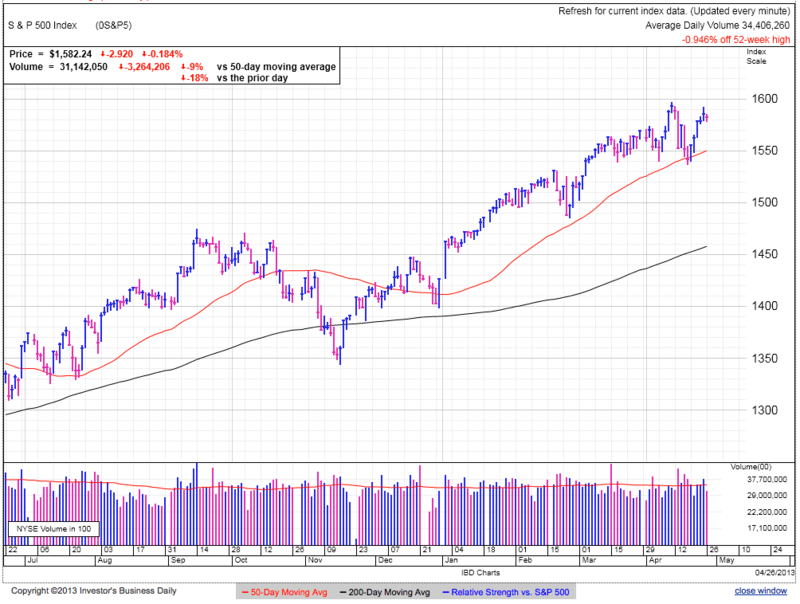 The stock finished near the lows of the range, but found support above the 200dma. 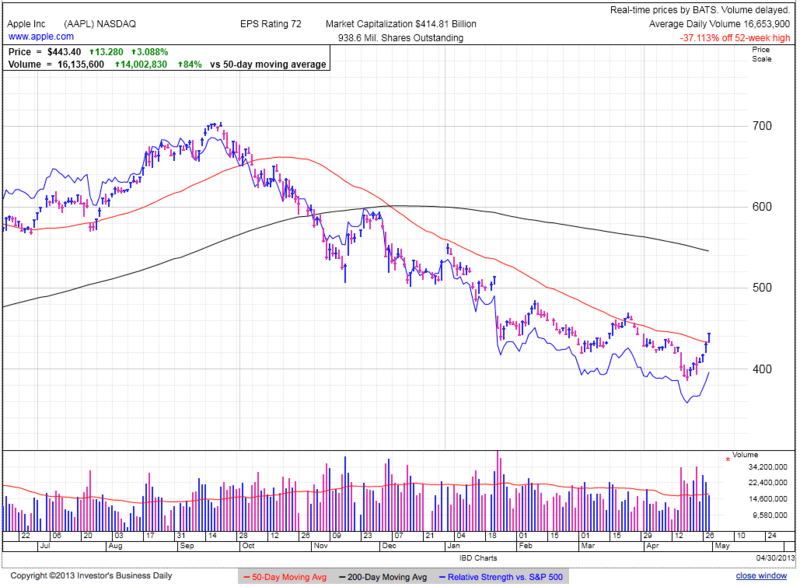 A high volume break of the 200dma is a good short trigger and will allow a trader to avoid a near-term bounce. If someone wants to buy the stock, this isn’t a bad place to own it with a tight stop at the 200dma. Stocks are down in early trade on the heels of a decent US economic growth number, but it fell short of expectations. It is almost comical how the market is indifferent to lousy employment numbers, yet disappointed by encouraging economic growth. It appears far more concerned about continued money printing than real economic progress. The market is officially an easy money junkie and suffers from the same irrational behavior as an addict. It makes us wonder what will happen when the easing finally ends. I originally thought it would be a non-issue because a vibrant economic recovery would provide a smooth handoff, but if the market gets too wrapped up in easy money, it could be a shock to the system regardless of what the economy is doing. It is a bit premature to trade this, but something to keep an eye on. Various traders are expecting a breakout, a breakdown, or more sideways trade. Over the last two-months swing-trading was the right call, but we will eventually move out of this range. We have to decide if that will be higher or lower. Everyone knows we cannot continue higher indefinitely, yet the market stubbornly refuses to breakdown like everyone expects. We survived selling off in April and the next hurdle is “Sell in May…..”. But if everyone expects it, can it still happen? When traders anticipate something, they trade ahead of it. They are either taking profits or selling short in front of the expected selloff. Even bulls are holding back purchases until they see better prices. When the market holds up in the face of this restrained buying and proactive selling, it makes us wonder what will happen when it flips around and goes the other way? Continuing higher defies logic, but that is how the market typically operates. A little selling after five-consecutive up-days is normal and expected. The question is if this is simply one-step back after two-steps forward. As long as the market holds prior resistance at 1570, the rebound is still going strong and we will eventually break this logjam to the upside. The market is a patient beast and it often wears us down before revealing the next move. It has a notorious habit of convincing us we are wrong just before proving us right. I gave up waiting for the correction and that makes me nervous. March’s overhead resistance at 1570 will provide support for a modest step-back and is a buying opportunity for the next move higher. Breaking 1570 means a retreat back into the trading range and expect more sideways trade. Testing and violating 1540 signals the selloff is finally taking hold. AAPL is modestly higher and finding some breathing room above $400, but well under previous support at $420. Until people have a reason to buy this stock, expect the slide to continue. The next negative catalyst will be the launch of a warmed over iPhone5s with some extra gimmicks no one cares about. AMZN is down huge after earnings and just a hair above the 200dma. 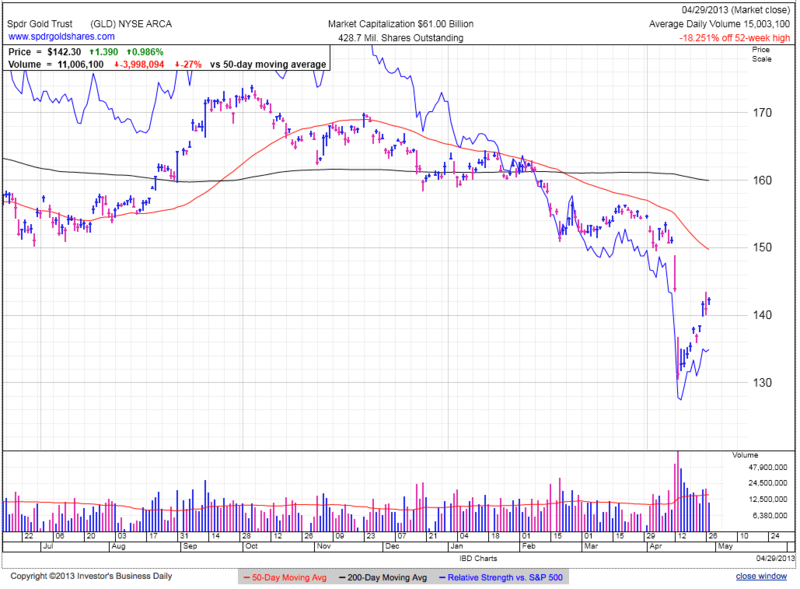 A short looks real interesting if it falls another couple of dollars, but watch for a bounce off the 200dma. An alternate entry is waiting for the bounce to fail and short it as it retreats through the 200. The win streak continues as the market finished higher for the fifth-consecutive day and is less than 1% from all-time highs. 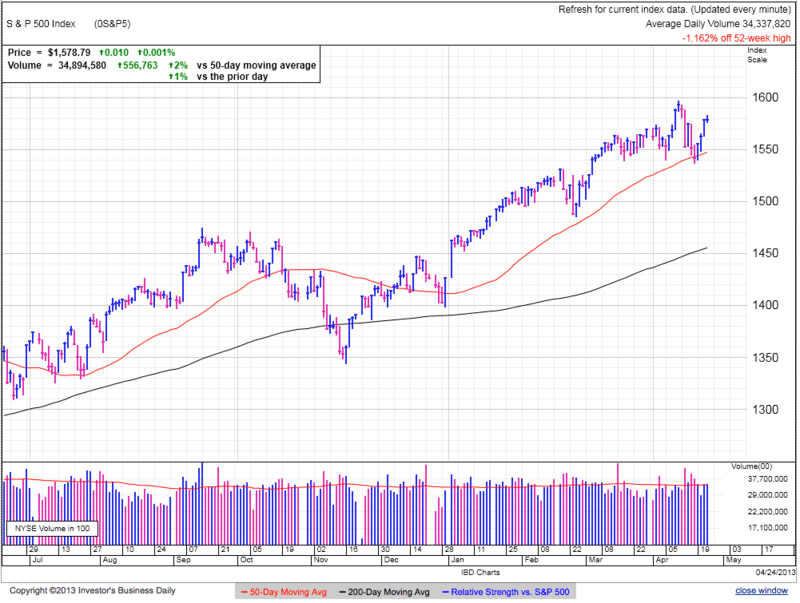 Volume was above average but the day ended in the middle of the range due to a ten-point afternoon selloff. Here we are pushing up against all-time highs again. Bears reassure themselves with the afternoon selloff and will surely explain away new highs as building a double-top. These are both valid points, but are they enough to finally bring down this resilient market? Bulls and bears are evenly matched as shown by the sideways trade, but when in doubt stick with the trend. I’ve been cautious since early March. I thought the market would struggle with the transition to the second quarter, but it held up nicely instead. The market flirted with 1540 three-times and bounced decisively after each. Topping markets run out of steam, but this one keeps going and we cannot dismiss that. There are a million reasons for this market to go lower, but it isn’t listening, at least not yet. Picking tops is hard to do and we get it wrong far more often than we get it right. It simply comes down to probabilities, a market continues countless times but reverses only once. This market is not giving any signals it is ready to breakdown, so stick with the rally until something new develops. Every rally must come to an end and this one is no different. The higher and longer we go, the bigger the eventual correction will be. We have a couple more weeks to see if the expected May selloff takes hold, but if the rally continues through the Summer, look for a larger pullback this Fall. The market can do three things here, up, down, and sideways. Breaking and holding 1597 shows the rally is ready to continue. Finding a ceiling at 1600 means the trading range is sucking us back in. The breakdown only takes hold if we fall under 1540 again. We are closer to the upper end of the range need to watch for the breakout, but guard against the swing-trade lower. If someone is out of the market, it is a little late to buy and early to short, so wait to buy the breakout or sell breakdown in coming days. AAPL had an uninspiring up-day as it finished at the lows of the day. 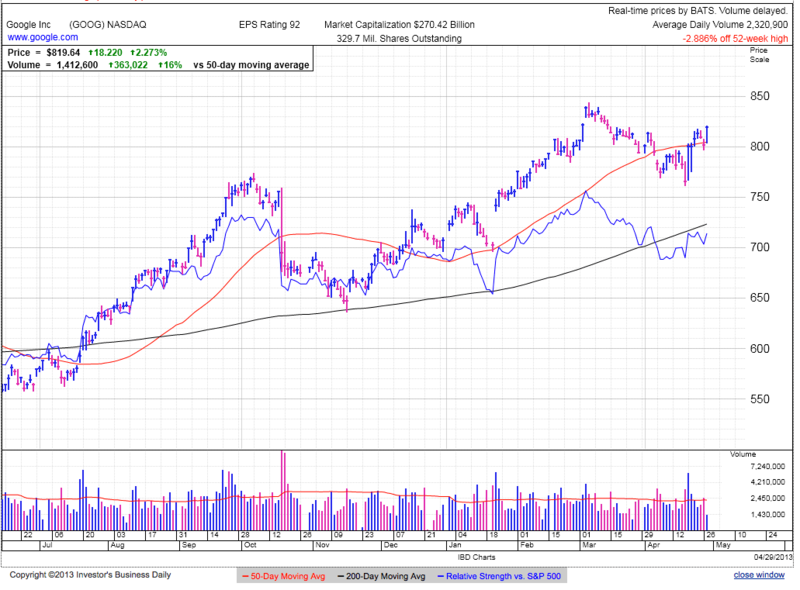 Volume was well off of average as few felt compelled to adjust their position two-days after earnings. A lot of hopeful holders are still hanging on, but another move lower without a fundamental catalyst in sight will demoralize the last optimists and ironically lead to the end of the selloff. AMZN dipped in after-hours trade following earnings and closed extended trade near the 50dma. A material breach of this level on Friday or coming days makes an attractive short entry, but if the stock holds up it is a better buy than short. This is a momentum story so wait for momentum to develop and don’t jump in front of this stock on principles alone. Stocks continue the rebound as we approach recent highs. 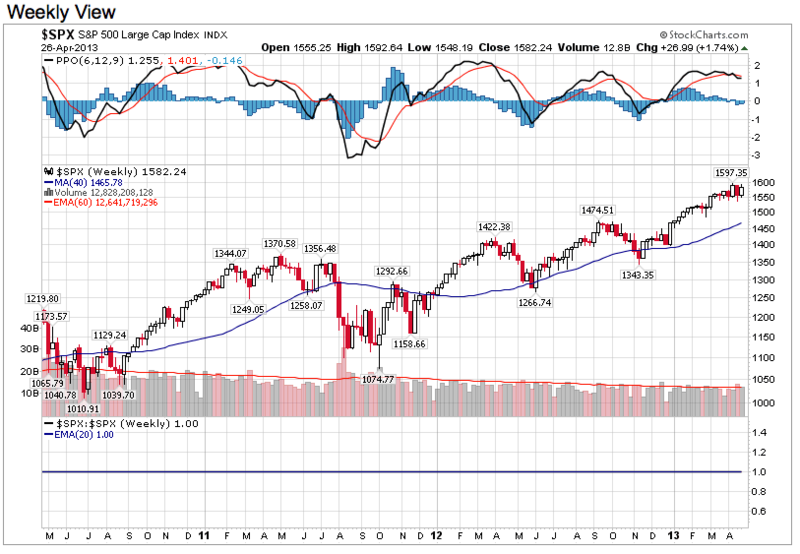 Will the series of ups and downs continue, or is the market finally ready to march higher? The expected pullback remains elusive. Even bulls are cautious near all-time highs and that wariness on both sides is what keeps propping up this market. No doubt there are chasers running in, but the majority is reluctant to fully embrace these highs because common sense tells us we’ve come too-far, too-fast. People often look down on dumb money that impulsively rushes in and out, but many times smart money over analyzes the situation and misses the trade. Smart money is taking profits here after such a long run, but we keep marching higher, what gives? To figure this out we need to understand what other people think and how they are positioned. Those that expect near-term weakness are taking profits and holding back on new purchases, but the market is unfazed by this selling and reduced demand. Without a doubt the market will pullback at some point, but we have to acknowledge the strength in this face of this selling is impressive. Cautious smart money will eventually be right, but making money in the market is all about timing and no matter how smart we are, if we get the timing wrong we lose money. Many traders are light this market ahead of the expected pullback. If they already sold, that selling pressure is removed from markets and makes it easier to head higher. Big money is bullish on this market but hates buying new highs. They often wait for the dips to stock up and that is why every dip finds a floor. Swing-traders and dip-buyers do not have the resources to keep supporting this market for this long, meaning real money is standing behind this move. We can trade our opinions or we can trade the market and this market simply refuses to breakdown. Without a doubt this market will selloff at some point, but it is not giving any signals the breakdown is imminent. In fact it is far more resilient than most expected and that is extremely bullish in of itself. I don’t feel comfortable with the rally, but the hardest trade is usually the right trade. Without a doubt this rally is living on borrowed time and will breakdown at some point, but the trend remains higher and will likely continue for a while longer. I’ve been bearish on this market for six-weeks and while its largely moved sideways in that period, the lack of a breakdown make the continuation more likely. But “more likely” is not a guarantee and we need to continue watching for the inevitable selloff. Markets have a habit of convincing us we are wrong just before proving us right. Its taken me a while to come back around to the rally, and I very well could be changing my mind just the selloff begins. But I’m okay with that because as a small trader I can reverse my position in a moments notice. I don’t mind being wrong, but I can’t stand staying wrong. The rally is intent on taking out 1,600 and that will continue the pattern of higher-highs. 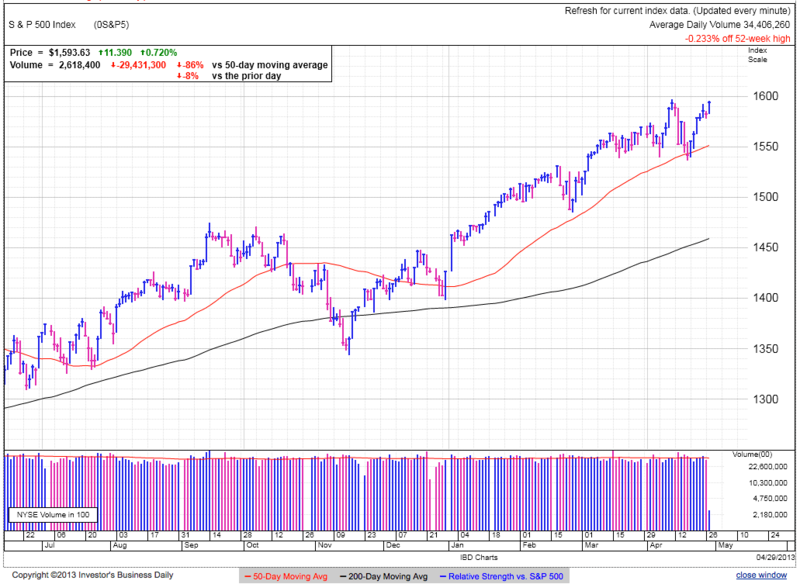 It is possible buying stalls after new high as the up and down continues, but the rally is not in jeopardy until we break the 50dma at 1450. I will be more cautious if the rebound stalls short of news highs at 1597. AAPL is up modestly following Tuesday’s earnings. It appears some buyers are encouraged by they lack of a selloff and feel more comfortable with a potential negative catalyst removed from the stock. But they are ignoring the trend and are bottom-picking, something that hasn’t worked well for many AAPL bulls. A popular definition of insanity applies here, doing something over and over yet expecting a different result. AMZN is higher ahead of earnings. Even though the valuation is sky-high, Bezos knows how to play the market and I give him the benefit of the doubt when it comes to wooing shareholders. If earnings disappoint, there is a lot of air under this stock and plenty of time to get in on the short side with far less risk. PM: Can the rally continue? Stocks closed unchanged on average volume. This was the fourth-day buyers showed up in sufficient numbers to support these levels. It is really hard to get excited about the market here, but that is what makes it work. Everyone expects a pullback, even bulls preface their bullishness by saying they expect near-term fluctuations. What this means is those fearing a major correction already out. Swing-traders took their profits and are ready to short this market. Even bulls are waiting for weakness so they can add to their positions. Most of the selling already took place and we have a growing pool of money outside the market ready to come back in. This is why the inevitable selloff still eludes us. Good old supply and demand. Sellers threw everything they had at this market and here we stand, 1% shy of all-time highs. If this was the best bears could do, there is nowhere to go but up. I don’t understand it, but that’s the way the market works. If this made sense anyone could do it. Until yesterday the Expected Outcome was a selloff but it just hasn’t worked out that way. 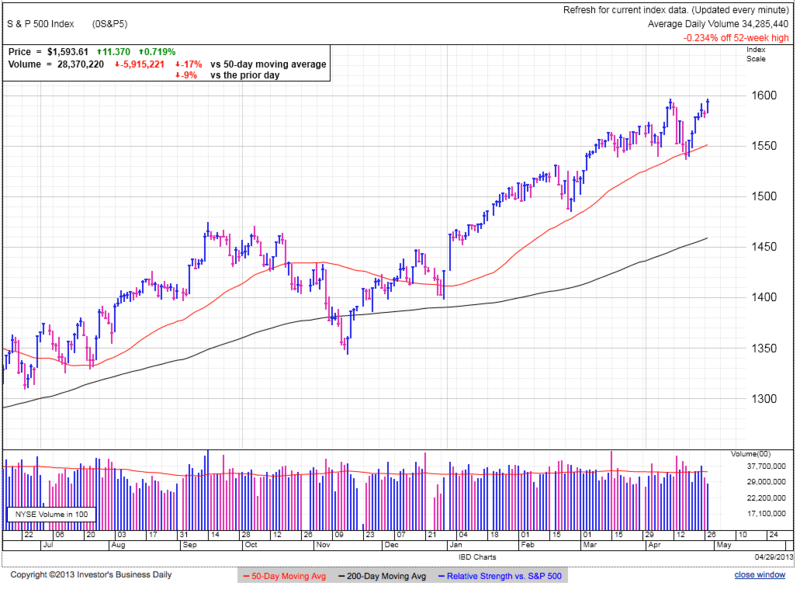 Buyers continued buying this month and we found solid support at 1540 and the 50dma. I still don’t trust this market, but it nullified many of my criticisms and I must acknowledge and respect that. I don’t have to own the market here, but bulls deserve credit for putting up such a good fight. Just because I stopped fighting this market doesn’t mean I embraced it. I remain paranoid of our precarious position and 1540 and the 50dma are the key levels to watch. As long as we hold above these the rally is on, but another test and violation of support is unlikely to bounce back. Stay with what is working, but keep a close eye on the exits. 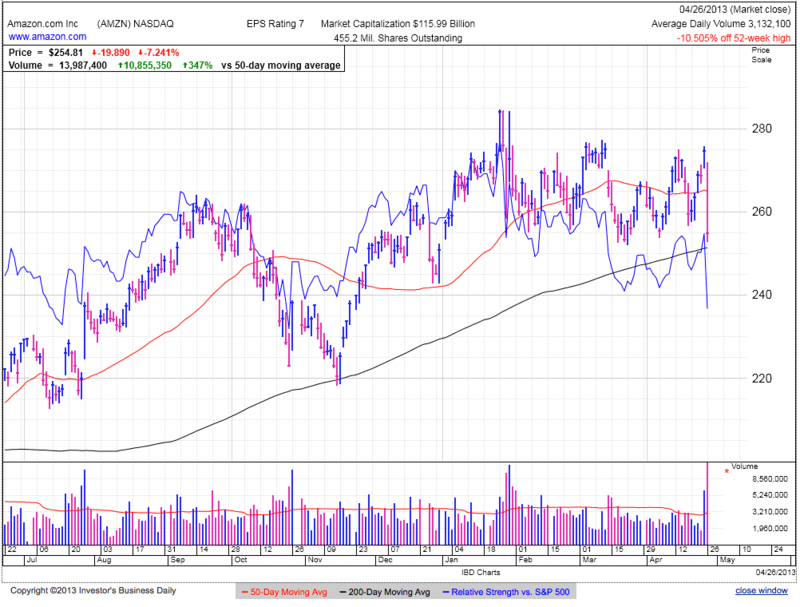 AAPL’s increased dividend and share buyback program failed to impress and the stock finished flat on the day. Most interesting is how little the stock moved following earnings. Results were a mixed bag and both bulls and bears got a little of what they wanted. But we have to award the draw to bears because momentum is clearly on their side and another fundamental catalyst came and went without reigniting the stock. Realistically speaking the most bulls can look forward to is a minor refresh of the iPhone5 and a retina display coming to the iPad mini. What else is there to bring this stock back to life? Look for selling to continue and even accelerate into the mid to lower $300s. This will be the last flush and finally put a floor under the stock. The most loved stock needs to become the most hated and today’s uninspiring earnings moved us one step closer. 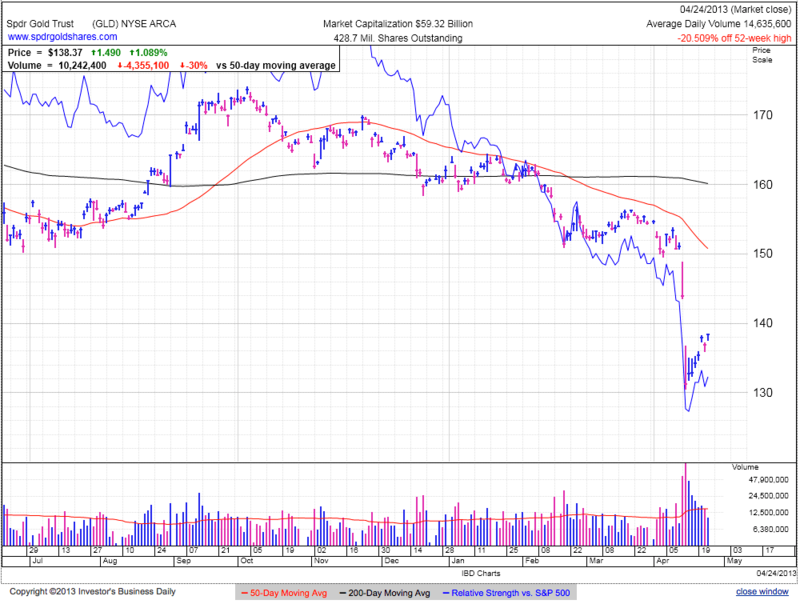 GLD is making a comeback, but the obvious bounce is rarely the real bounce. Everyone is buying the dip and that is why the price is coming back, but what happens when dip buying dries up? This occurs often enough on Wall Street that it earned the name “dead cat bounce”. I cannot say how long or high the bounce will go, but we will retest $130 before this is over, making this a better selling opportunity than buying one. I’m not a gold bull or bear and don’t have a particular opinion one way or the other, I am simply looking at it from a crowd psychology vantage. The speed of how quickly dip buyers embraced the selloff makes me suspicious. NFLX traded flat after blowout earnings. There are still a truckload of shell-shocked shorts praying for this gap to slide back down, but unfortunately the market gods are far more inclined to humiliate the hopeful and desperate than help them. AMZN reports earnings Thursday and this one is a coin flip With such an outrageous valuation the stock is standing on a trapdoor and any bad news will send the stock reeling. But Bezos and Co are masters at pulling rabbits out of hats. Can they do it again? Buying or shorting earnings is like betting on black or white. The safer and higher probability trade is waiting for the news and then trading the subsequent move.